If it hadn’t been for the Desolation of Smaug, I would have been pretty unexcited for the release of The Battle of the Five Armies. DoS, while still not in the same league as any of the Lord of the Rings movies, at least stirred up some of the feelings of awe and wonder that the original Peter Jackson trilogy did. I remember leaving the theater pleased enough to look forward to the release of the next movie. Unfortunately, The Battle of the Five Armies failed to live up to the promise established by DoS and ended our time in Middle Earth rather feebly. 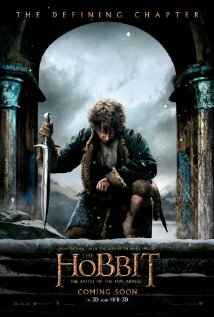 The action in TBotFA (that’s a mouthful) picks up where DoS left off: Bilbo Baggins (Martin Freeman), master burglar, and his merry band of dwarves led by Thorin Oakenshield (Richard Armitage) have awoken the dread dragon Smaug (voiced by Benedict Cumberbatch) from his over century-long slumber in the Misty Mountain. Smaug, who apparently deeply valued his rest, unleashes hellfire on nearby Laketown. The bulk of the film and the titular battle for Misty Mountain (and the hoard therein) take place during the aftermath of Smaug’s attack. This iteration of The Hobbit was always at a disadvantage since it had live in the shadow of the epic LotR trilogy. To approach, equal or surpass what those movies accomplished was an insurmountable task and honestly, a lot of that could be chalked up to the source material. That’s not a knock on the book, but it just seems impossible that Bilbo and Thorin’s company’s stakes in The Hobbit could compare to what Frodo and the Fellowship of the Ring fought for/against in The Lord of the Rings. That probably wouldn’t have been an issue if The Hobbit had come out before LotR, but unfortunately that’s not how things played out. It’s also possible that I’m the only one who can’t help but incessantly compare the trilogies. That really was the biggest, movie-crushing issue. The epic-sounding (and looking) Battle of the Five Armies felt hollow. Yes, characters we kind of liked and cared about (although still not as much as even Boromir) were risking their lives, but for what? It all seemed so petty. The gravity required to make a battle like that as devastating as it should have been simply wasn’t there. And when the event that an entire movie is focused on doesn’t deliver, the movie’s in trouble. As far as the “kind of liked and cared about” characters, there’s another fatal flaw. Jackson seemed to do a much better job in LotR of making a large and diverse cast likable and memorable. In TBotFA, I could recognize/name/distinguish about seven of the characters and four of those seven also appeared in LotR. Of course, trying to make twelve dwarves unique and distinct would be quite a challenge (which is why I imagine Jackson didn’t even attempt to) but there we have another possible limitation of the source material. Performances were all about what you’d expect. Martin Freeman and Richard Armitage were solid. Ian McKellen as Gandalf was a delight as always and seeing the beautiful and elegant Galadriel (Cate Blanchett) finally demonstrate her (only previously alluded to) vast powers was a real highlight. But there was some stuff that seemed pretty cheesy, too, centering around a shoehorned-in romance between Tauriel (Evangeline Lilly) and Kíli (Aidan Turner) as well as some lame fan service regarding Legolas (Orlando Bloom) and a young Ranger named Strider. Sidenote: Bloom is definitely starting to show his age. This has actually been a rather challenging review to write because there isn’t necessarily anything glaringly wrong or bad about TBotFA. All of the parts comprising the movie are certainly adequate but there are also very few parts or moments that really stand out. This movie (and trilogy for the most part) is stuck in that limbo of mediocrity. There’s nothing to hate but there’s also not much to love. It just… is. If you’re a fan of Peter Jackson’s vision of Middle Earth, it’s worth seeing if only just to round out the set and to have one last romp through the world (unless he decides to tackle The Silmarillion). It’s unlikely you’ll regret it. If you do find yourself wanting your two and a half hours back, don’t worry; in a couple weeks, you’ll forget that you even saw it (ok, that may have been too much).